This is a journal of my weight loss progress starting August 08, 2014. It shows each time I weighed as well as notes about my progress. I tried Soylent for weight loss. It worked for me but it is very expensive and made from genetically modified foods. Soylent is more suited to someone who is in a coma. It will keep you alive and healthy but it is not mentally or physically satisfying. As you can see below I could only manage 2 shakes a day not 3 because it was boring and depressing so I had to eat at least a single meal of real food. 2017-01-13 – 125.6 lbs. Getting about 1650 calories a day. 2017-01-21 – 123.2 lbs. Raising caloric intake to 1730 calories a day. 2017-02-03 – 124.8 lbs. Water sauteing more foods for easier digestion. Still eating about half raw. 2017-04-15 – 124.4 lbs. Ate too much fermented plum (130g) at a time. Lost 3.79 lbs of water weight in a day. It was very painful. 124.4 is much closer to my actual weight. 2017-05-04 – 124 lbs. Actual weight. Ate something bad or too much melon. 2017-05-19 – 128.6 lbs. Eating about 1600 calories a day and doing yard work. 2017-05-27 – 124 lbs. I think my damn scale is broken. It shows the correct weight first and changes to the wrong weight. It never used to do this before. I ordered a new one and a dumbbell so I can see if it is calibrated correctly. Have started eating 50% vegetables and 50% fruit to help with digestion. Vegetables for breakfast and lunch and fruit for dinner and 4th meal. I have also started exercising again. I am also not doing as much yard work as before. 2017-06-03 – 126.8 lbs. Should be close to correct since I replaced my scale. 2017-06-10 – 128.8 lbs. Lowering calorie intake to 1488 calories a day for a month. 2017-06-16 – 127.2 lbs. Exercising switching between a Pilates video and lifting a 10 lb. weight every other day. Switched from fitday.com to cronometer.com calorie counter which is much better because it allows me to track water intake. Water intake was too high 285% of dv. I have reduced water intake by 80% of dv by removing 12 cups of water from my diet now I am able to sleep better and I have more energy. 2017-06-23 – 126.2 lbs. Was low in zinc and selenium. Since I am off grains right now I will start eating a box of mushrooms a day which should provide enough. I am also trying to figure out how to sleep through the night without waking up every 2 hours to use the bathroom. I will also stop drinking Decaf Tea before bed unless I am unable to fall asleep. 2017-07-07 – 127.4 lbs. Try adding grains, starches, and beans to each meal. Each meal should contain 200c Vegetables, and then 100c Grains (brown rice, black rice, whole wheat spaghetti, quinoa), Starches (potatoes, corn) , or Beans (dried, black, lima, pinto) . Also will need to start taking a zinc supplement because a box of mushrooms a day will cost about 100.00 a month. 2017-07-14 – 125.8 lbs. Have been using free weights more especially when I feel tired. I am taking a zinc supplement and 3mg of Melatonin every night. I have started freezing my Vitamin D Mushrooms so that I can eat the recommended amount each day and not have to wolf down 2 boxes of mushrooms in 2 days. 2017-09-09 – 125.8 lbs. 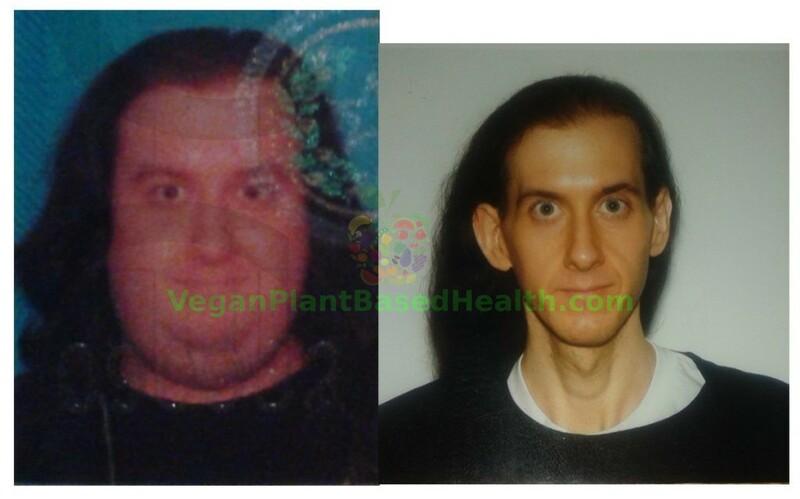 One year since starting veganism. Everything is going great. I have been walking in the morning for about 30 minutes everyday to help keep my heart rate up. 2017-09-15 – 123 lbs. – Got a Squatty Potty. 2017-09-29 – 122.8 lbs. Walking 30 minutes a day except Saturday which is for 15 minutes. Sunday, Tuesday, and Thursday I have been lifting a 10 pound free weight, 7 sets and 10 reps of standing curls and overhead presses. Monday, Wednesday, Friday I do Pilates. 2017-10-13 – 118.6 lbs. – I have stopped taking all supplements and as a result I am able to sleep better. For B12 I eat Bragg’s Nutritional Yeast and for vitamin D I eat irradiated mushrooms. 2017-11-03 – 117.2 lbs. – I am doing 9 sets of 10 reps with free weights now. The squatty potty, walking, and free weights are probably why I have lost more weight. 2017-11-19 – 118.4 lbs – I am up to 10 sets of 10 reps with free weights. 2017-12-01 – 119.2 lbs – Stomach and Intestinal Problems, Diarrhea for 24 hours. Lifting 11 sets of 10 reps with free weights. 2017-12-29 – 115.8 lbs. – Eating less vegetables and more legumes, grains, and nuts to save money and make me feel less heavy after meals. Lifting 12 sets of 10 reps with free weights. 2018-02-09 – 115 lbs. – Eating beans and leafy greens everyday. Rarely eating nuts. The bad weather is causing me to feel depressed. Need some sunlight here. Weightlifting is at 14 sets of 10 every other day. 2018-03-30 – 117 lbs. – Experimenting with fasting to reduce appetite. Reducing size of meals by limiting weight of fresh vegetables to 200 grams total. Eating soy bread and drinking more homemade plant milks. Using lots of spices. 2018-08-10 – 119 lbs. – Sugar Kiss Melons are in and I purchased 32 of them at once. Trying to fill my freezer with diced Sugar Kiss for winter when they are no longer available and as you can see I eat a lot of them while I prepare them. I ended up with 70 melons in my freezer. 2018-08-31 – 114.6 lbs – I walk for 30 minutes each morning, noon, and night. I do Pilates every Monday, Wednesday, and Friday. I also lift weights 10 lbs. 14 sets of 10 presses and curls every Sunday, Tuesday, and Thursday. Saturday I rest. I have started eating breakfast at 3pm and lunch at 3:30pm – 4pm each day. Then I prepare fruit for freezing if I need to. I eat dinner at about 7:30pm and 4th meal at around 8:30pm – 9pm. I go to sleep at about 10pm. This helps to reduce cravings for me at least. Also I have had upper back problems for the last year. I have noticed that I have not been standing up straight so I have corrected this behavior and it has been such an improvement. My upper back pain is gone. 2018-09-09 – ???? 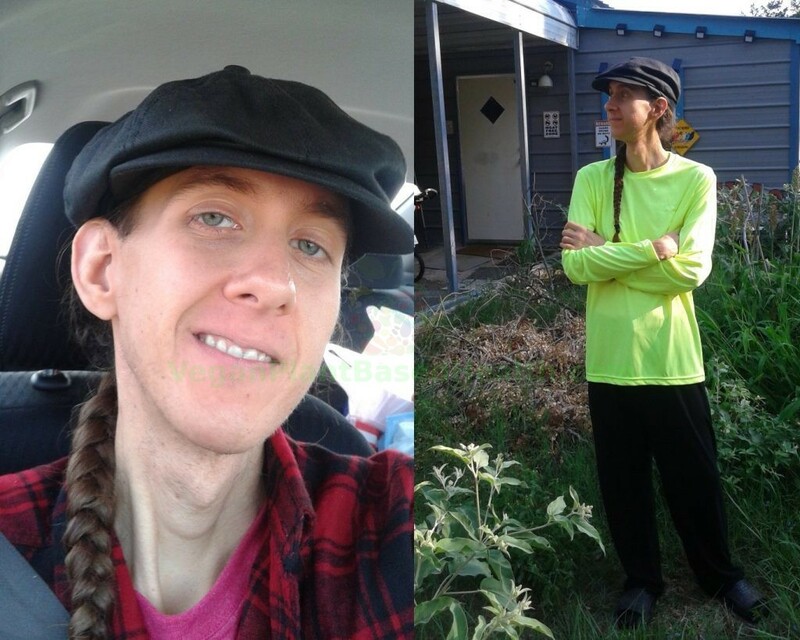 – Two year Veganniversary! 2018-09-28 – 111.8 lbs. – Digestive problems, stomach virus. 2018-10-05 – 115 lbs. – Feeling great! 2018-11-16 – 112.6 lbs. – Since I seem to be maintaining my weight pretty well. I have decided to only weigh once a month. I have been eating a snack of grains such as spaghetti or rice at around 3 – 3:30pm or cutting up fruit for freezing and snacking on that. I find that when I eat grains I don’t get cravings but if I eat fruit I do get them. 3 – 3:30pm Snack – Eat grains or cut up fresh fruit to freeze. 6pm – Breakfast & Lunch – 2/3 Grains, Beans, or Potatoes, 1/3 Vegetables. 7pm – Dinner & 4th Meal – Dinner 1/2 Oatmeal, 1/2 Banana, 4th Meal – 1/2 Banana, 1/2 Melon or other fruit. Also I have noticed that I don’t get as cold as I used to. I am able to sleep using a thin blanket while wearing a light long sleeved shirt when it is 30 degrees outside and I have the heater on 65-68 degrees. Sometimes I use a fan at night. During the day I set the heater to 72 deg. I also do more cooking such as baking potatoes and boiling vegetables or grains which helps heat the house during the day. I think eating more bananas and less melon has also contributed to this. 2018-11-26 – I have purchased a stationary exercise bike. Will be trying to use it for about 15 minutes a day and replacing the calories burned with rice and spaghetti. Stationary bike broke down after 2 months. It needs a new belt and wheel. I am unable to repair so I will be getting rid of it. https://smile.amazon.com/dp/B005T4YHCE Don’t buy this bike. The extra exercise really helped mentally and physically. I felt even better. I was doing 15-20 miles a day but I reduced it to 30 minutes a day because it was taking up a lot of time. I found out that we don’t need Nuts or Avocado for Omega-3, ALA, DHA, EPA. We only need the trace fats found in any vegetables and legumes. I never liked including compact calorie, high fat foods in my diet. Caffeine and theobromine should be avoided because they are stimulants and affect sleep. So avoid caffeinated coffee, tea, and chocolate. Carob is a good replacement for chocolate because it does not contain the stimulants caffeine and theobromine. 2019-04-01 – Weight 119.4 lbs, BMI 19, Body Fat 9.7%, Muscle Mass 102.4 lb. Have been doing free weight floor presses in addition to my usual exercise. I have also been watching videos by ChefAJ and Dr. John McDougall. Have started eating more sweet potatoes, rice, beans, and whole wheat pasta. Have stopped eating garlic, onions, cabbage, and Brussels sprouts because they give me digestive problems. I also stopped eating avocado, nuts, and seeds because they are high in fat. For the last few months I have practicing intermittent fasting to maintain my weight. I usually have breakfast at around 6-8pm and continue eating until bedtime 9-10pm. I guess you would call this the 20:4 method which is 20 hours fasting 4 hours eating. It is not constant unrestricted eating for 4 hours. It is eating 4 meals in a 4 hour window. Sometimes I get tired at around 2-3pm and I will have a snack at that time. People are not supposed to eat right before bed if they want to lose weight but this has been working for me. I cannot go to sleep hungry. I may be doing 20:4 but I am still Vegan. This is not The Warrior Diet.